ey guys! Have you seen a tablet built in a laptop case? No? Well, stay with us then.You know that there are no rules for innovation in technology. It can be anything as long as it is functional and well-performing. This is a very accurate description for the new Dell XPS 12 convertible touch ultrabook. At first sight the appearance impressed us with the textured case surface. It does not attract fingerprints and is finely underlined by the silver border line along the edges. The chassis is constructed from durable materials – machined aluminum, bonded Corning Gorilla Glass and carbon fiber – simply a wonderful make. The 12’’ sensor screen easily converts into a tablet with a single flip and fold motion. Just rotate it inside the aluminum panel rim till it provides the most comfortable angle. Flip the screen and close the laptop there you go, you have a tablet. Now the world is at the tip of your fingers. The flipping mechanism runs smooth and is stable as Dell says it stands out with durability. The hinge of each unit has been tested to 20 000 cycles, which stands for doing 10 flips per day for the next 5 and a half years. The 170-degree viewing angle combines perfectly with the ultra bright 400-nit display, they deliver a superior visibility and crisp detail from any possible angle. The graphics are brought to you by Intel HD 4000 graphics. Being a member of the Dell XPS family, this ultrabook provides the smooth performance one would expect, even more. Equipped with 3rd Gen Intel Core processors it responds immediately to your touch commands. 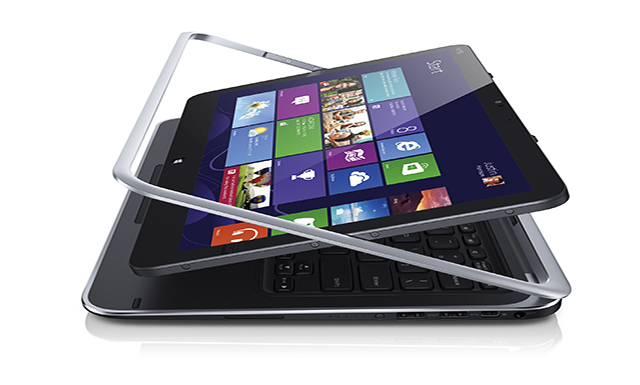 This ultra convertible touch screen ultrabook comes loaded with the new Windows 8 operating system that offers all the latest news, headlines, games and music at the tip of your fingers. Of course, you can always easily switch to the well-known desktop mode. What is more, thanks to the featured Intel Smart Connect Technology, you are always up-to-date with all the new emails, work contacts, social contacts even when the ultrabook is in sleep mode. It automatically updates all the important data you need. Equipped with 3rd Gen Intel Core processors it responds immediately to your touch commands. This functional ultrabook has a 1.3MP webcam and a dual-array digital microphone that let you stay in touch with everyone. The keyboard is a full-sized, backlit and more importantly is spill-resistant. However, we wish the enter key was a little bigger. The button touchpad is glass integrated and a very functional one. It supports gestures. The battery on the Dell XPS 12 is a 47 watt-hour 6-cell Lithium Ion one. When it comes to ports and slots the chassis offers 1 USB 3.0, another USB 3.0 port with PowerShare and Windows debugging, 1 mini-display port and a headphone/microphone combo port. The Del XPS 12 weighs around 3.35 lbs.